1. It’s more stores to go to…..more time spent coordinating and clipping and calculating and shopping. 5. Both use their own version of OYNO coupons on many of the items, which means you have to go back within 2 weeks to use the coupon AND you often need to split your shop into multiple transactions in order to roll these coupons and not end up with either a lot of OOP costs or a huge amount of OYNO coupons at the end. I calculated this out in great detail before my trip and stuck exactly to my list, though I moved it around a little to make sure I didn’t lose out on any of the Register Rewards (RR). My biggest snafu was that I didn’t realize that technically the RR are manufacturer coupons and you can’t use more manu coupons that you have items. So if I bought 3 items and used a manu coupon on each of them, I can’t also use a RR in that transaction. I didn’t realize this and so was not able to actually roll the RR like I had planned, which resulted in me paying more OOP and having a bunch of RR leftover. Oh well, I’ll just have to go back! I also bought a Gummy Bears for $1 so that I could use my $6 RR Contact. Stupid move but this is when I discovered the manu coupon/RR restriction thing and I panicked a little. I LOVE gummy bears though so all’s good. There was a promo: Buy $10 selected snacks, get $3 RR + 2 redbox rentals. For a ﻿grand total of $8.70!! 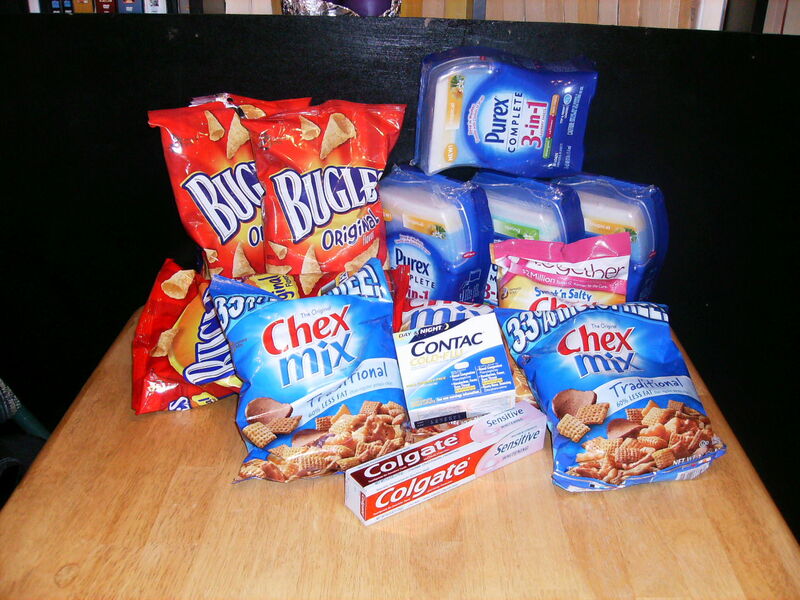 Into the donation pile: 2 of the Purex, the Colgate toothpaste, 1 Bugles, 2 Chex Mix. I guess I have to say that that was worth it!!! The hardest part of putting together the deal was figuring out which coupons I did and didn’t have when looking at the online deals sites (forthemommas.com) (wildforwags.com). I don’t regularly get all the inserts from the Sun. papers and I don’t always get to certain printables in time so that makes it more complicated. And then RiteAid….where I had the slowest old lady cashier ever. At least everything worked out just like I had planned it. The only thing was the unknown of what some of the prices would be. Can you tell that cold season is upon us! lol I broke this into 3 transactions in order to take advantage of the +Up (UPR) coupons. I did watch of ton of the October videos yesterday so I had a few VV coupons available for use, and luckily only one of my items had a SCR (single check rebate) so that’s less OOP. Here goes…. So I am pretty happy with this!!! 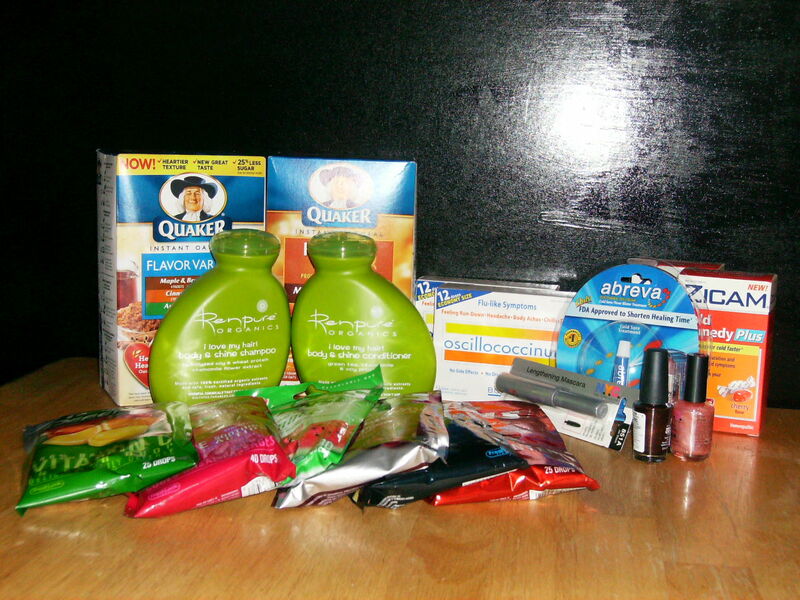 I got some great freebies and some other really really cheap stuff that I will use (eventually!) Into my medical/backstock/gift basket drawer went the Halls cough drops, the Zicam, and the Oscillococcinum, and makeup. I donated the Quaker Oats. I use Zicam, Abreva, and cough drops so those will definitely not go to waste. And considering the shelf cost of those, its great to have some backstock around that I got at a GOOD price, not just whatever it happened to be when I needed it. I will probably keep my eyes on the drug stores. I don’t know that I want to have to go every week but if not, I have to be really careful about having leftover RR or UPR that will go to waste. We’ll just see what kind of deals come around. Yeah so I didn’t get around to the cheese..
Ok I have been busy (and lazy too!) so I haven’t been posting all my awesome deals. 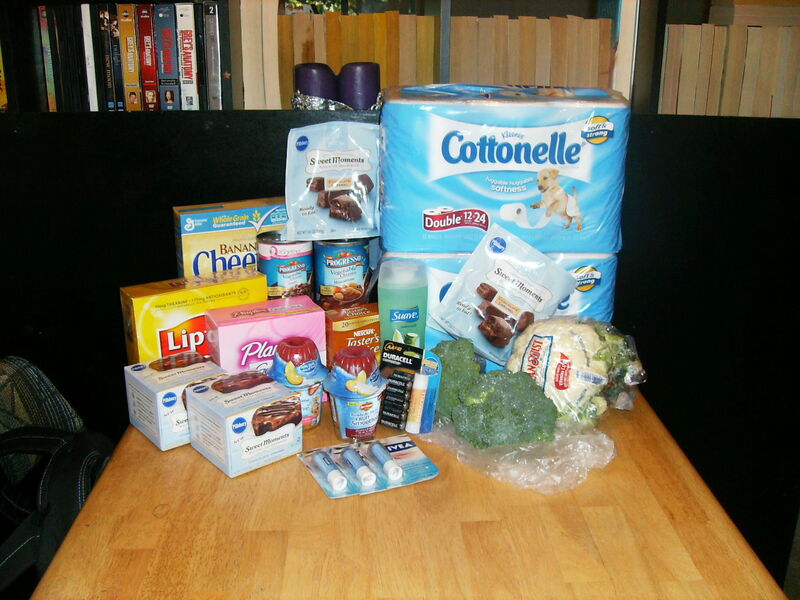 But take heart, I HAVE been keeping up on the super couponing, just not taking the time to post it all up. There was this ridiculous cheese and hot dogs deals……basically I bought something like 25 bags of shredded cheese and 15 packs of hot dogs for free. But I didn’t take any pics and I don’t have the energy to go back and calculate through all the receipts. Suffice it to say that I have lots of hot dogs and I sent a ton of cheese and hot dogs to my friend Ash. These are the moments that I jones for a spare freezer…..
Nivea lip care chapstick is $2.97 normally but was on sale for 99c. I bought 3 as I had (1) $1/1 and (2) $2/2 coupons which equals a $0.03 moneymaker! The other items were just items that I needed that were also good sales deals without being spectacular. I will use all of this, though I did put 2 of the Nivea chapsticks into my gift drawer. Ok so the Albertson’s deals were a little larger and more chaotic (catalinas) so that created the unfortunate necessity of multiple transactions. You get the best deals usually with catalinas but the multiple transactions make them more complicated, stressful, and gives more opportunity for things to go wrong. In this case, there is a Fiber one catalina running where you Buy 5, get $3.50 back. But for some reason, neither of my Fiber One catalinas printed, leaving me $7 over in my expected costs. I need to find the number for the catalina co. and give them a call. From what I can tell on my receipt, it appears that one of the flavors of the Fiber One bars are in the computer system as GM Cereal Bars instea of GM Fiber One Bar and this is probably why it didn’t print….but ALL the boxes clearly state Fiber One Chewy Granola Bar so I think the cata co will mail me the coupons. Annoying though, and totally through me off at the store. There was also a promo running through GM where when you bought $20 (AFTER manu coupons) you received $5 off (basically a 25% off each item). Here’s my plot, I did 3 transactions. This was soley geared to the $5/wyb$20 promo and taking advantage of a couple of cata promos that also overlapped with this promo. Total of $12.95 OOP ($6.45 after catas) and everything was donated. I used the previous $3 rollups cata to equal a total OOP: $10.20. 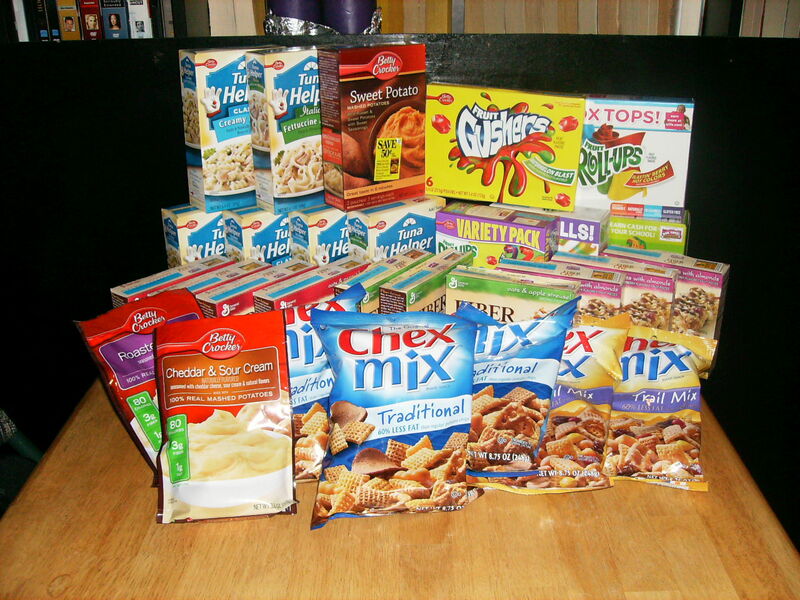 This is all stuff I will use, so it went into the stockpile that I have been slowly working on eating up. This was kind of a buy things if there is a great deal, seat-of-the-pants type of transaction. The only thing set on it was to get (2) 1doz. eggs that were on sale for 50c w/ in-ad coupon. I planned on using the $3.50 Fiber One cata from Trans.#2 that I didn’t end up getting. So I ended up with a higher OOP on this one than I thought: $10.20. Oh well. All in all, it was a good shopping trip. I got a bunch of stuff I needed, some really awesome deals, and added to both my donation pile and my stockpile of staples.